Published: March 4, 2014 at 03:04 p.m. Updated: March 4, 2014 at 06:06 p.m. In Around The League's offseason forecast series, we pointed out that the San Diego Chargers' first order of business this month will be freeing up salary-cap space by releasing overpriced veterans. The team started that process Tuesday, throwing in the towel on one of last year's biggest free-agent busts. 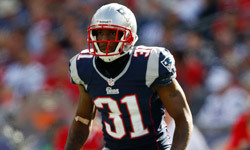 San Diego released cornerback Derek Cox and fullback Le'Ron McClain, a team source told NFL Media Insider Ian Rapoport. The Chargers later confirmed the move and announced that cornerback Johnny Patrick also has been cut. Benched several times in favor of fringe roster players, Cox was due $4.25 million as part of a four-year, $20 million contract signed last March. General manager Tom Telesco will end up shelling out $10.25 million in guaranteed money for 11 Cox starts. It's especially telling that Cox was unceremoniously dumped by a team in dire need of cornerbacks this offseason. A fine lead blocker with above-average running ability for the position, McClain saw his role diminish under a new coaching staff last season. NFL teams just don't pay millions to niche players limited to 12 percent of the snaps. Tuesday's cuts will free up $4.15 million in cap space on top of the money saved from wide receiver Eddie Royal's contract restructuring Monday. Expect Telesco to prioritize speed on both sides of the ball now that he's creating room to operate under the cap. The latest "Around The League Podcast" talked 49ers drama, franchise tags, and wide receiver rankings.